What are the best hammocks this year? We think Hamaca hammocks from Hammock Heaven are easily the best, but how about a quick look at some others from around the web. There are some interesting styles here. You will notice that other traditional style hammocks are much more expensive than ours. That is for the simple reason that we have cut out the middleman (or 2). We design and import our own hammocks direct from hammock manufacturers in Colombia, Brazil, El Salvodor and India. Feeling stressed, need some time out or just want to bask in the sun’s rays? Hammocks are a fun way to lounge outdoors, while gently swinging yourself to sleep. First developed in the jungles of South America where they were used for sleeping above the wet ground, hammocks have come on leaps and bounds in the style stakes since then. Made from fabric, netting or rope, they were designed to be tied between two trees, but these days many come with their own stands – and, if not, the stands are easily available to buy separately. Singular options are great if it’s just for you, but there are also double and family designs available, too – plus ones with cushions, canopies and all manner of shapes and sizes. 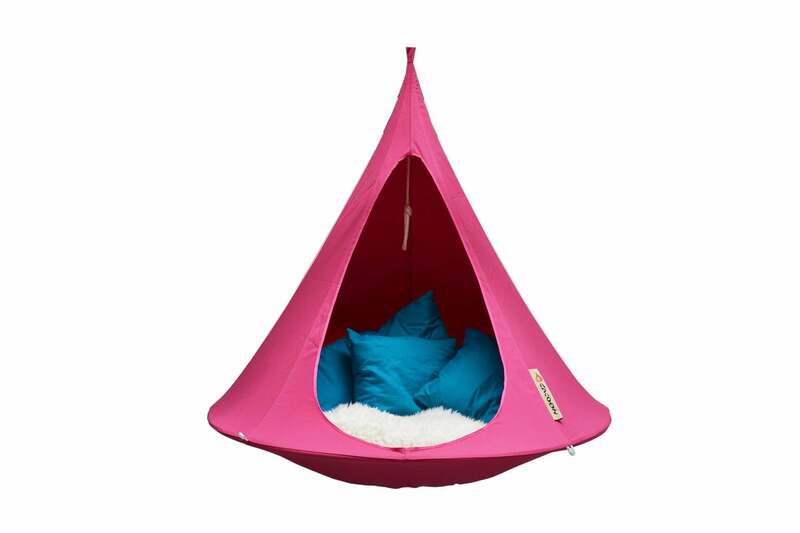 Swinging chairs, tent and even bed styles are all the rage and are growing in popularity as dreamy napping nooks for indoors as much as out. Then there are the portable options, which are ideal for taking away with you – and they’re not limited to tropical destinations, either! If you’re off camping then choose a model that’s light to carry and just as easy to pack away as it is to put up. Hammocks with spreaders are a modern invention, designed to spread the weight load more evenly and in turn making it easier to get in and out of the hammock. If you like to feel quite cocooned, you’ll want to go for an inline option (also called jungle or tropical hammocks), which are one of the most stable and comfortable, and allow you to sleep like a pea in a pod, surrounded by the hammock’s sides. Still undecided? We’ve pounded the pavement to find you a selection of good-looking favourites to help you kick back and swing your worries away. Here’s our pick of designs that hang way above the rest. Free spirits will adore this bohemian-inspired design, which looks like it would be equally at home on a palm-lined beach as it would in a north-London suburban garden. Made from hand-knotted natural cotton, we love the tassel fringing and airy material, which makes it easier to keep cool in the hot weather. As stylish as it is mellow, this laidback design is perfect for throwing a few cushions on, laying back with a cocktail and whiling away the hours while basking in the sun. FYI: mounting ropes are included with the hammock but any additional fixings would need to be purchased separately at any local hardware shop. 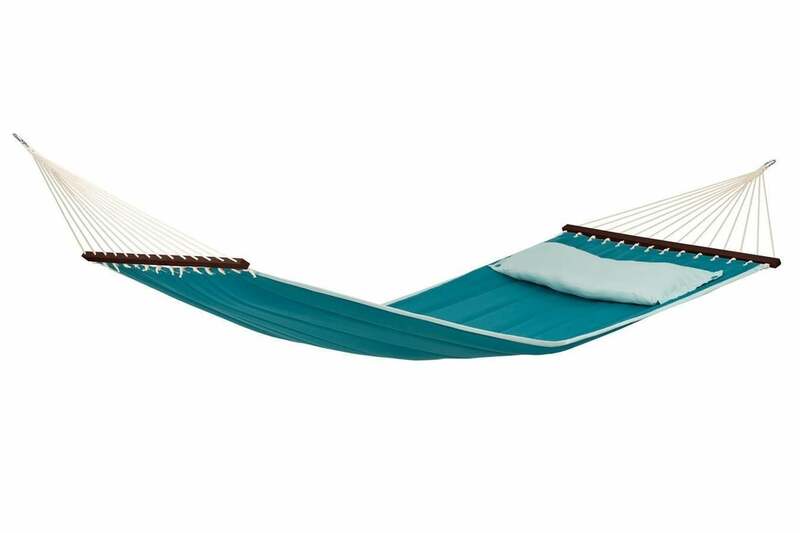 This sizzling scorcher of a hammock certainly lives up to its name… who wouldn’t want to have a siesta in this design? The Brazilians have been making hammocks for years, dating right back to the Mayans and this vibrant model features fringes, macramé elements and suspension cords that are all typical of hammocks from Brazil. Made from pure organic cotton, it has a diagonally flexible weave that is said to follow the contours of your body for extra comfort and is a double-width design, so there’s room for two. Just tie the ends to trees, walls or a hammock stand (which you’d need to buy separately) and then lay back and enjoy some R and R.
So, you would be right in thinking this is part chair, part hammock and we think it’s the perfect spot to curl up and read a book or just enjoy the sun. Hanging on an airy rope construction, it’s a Danish design that will have you feeling like a kid again with its swing-style cotton seat. Tie from a tree to enjoy during the summer months and then bring it indoors for the winter where its stripy pattern will be equally at home inside. With a height of 96cm and width of 50cm, it takes up to a 120kg weight. If you’re all about the comfort factor then this is the hammock for you. In fact, it’s one of those buys that you know will be worth its weight in gold for the hours of relaxation you’re likely to get from it. Made from polyester with a PVC coating, the hammock is filled with 5mm foam for the ultimate in luxury. It’s dirt and moisture repellent and sits on a sturdy metal frame – and there’s a choice of 10 different colours, including this dreamy turquoise shade. You can fit up to three people dependant on their size (the hammock measures 330cm x 110cm and takes up to 150kg) and if you’re buying a hammock to nap in, then this is our suggestion for your well-deserved snooze. The perfect pocket away from the world, this versatile, floaty number is ideal for packing up and taking with you on your travels. Whether you’re off camping, to the beach or on holiday, it’s extremely light and packs down into a small carry-bag, making it easy to transport. Once you’re there, it can be assembled in just five minutes. Designed to hold two adults or up to five children (200kg in total), the hammock’s canopy is removable if you’d rather feel the sun on your face. Although it’s light in colour, it’s machine washable and if you don’t have a tree to hang it from, The White Company sell a matching Tiiipii hammock stand. Dreamy! Isn’t it great when someone designs a product and thinks of all the handy little touches that just make it so EASY to use – and then puts it at a beautifully affordable price? That’s what we thought when we saw Ikea’s new Garo/Riso hammock and stand combo, which is available in other colours as well as this pale orange. Firstly, it has a wheel on one side of the grey frame so it’s easily manoeuvrable if you need it repositioned when the kids want to use the space for games – just tilt the stand and roll it out the way. Secondly, it has a small pouch on the side that is perfect for keeping a newspaper, suntan lotion or your sunglasses without having to reach down to the grass (and risk toppling over). The best part? It’s just £75! Well done Ikea. More bed than hammock, we can see this design being more of a whole-afternoon snooze affair rather than a quick catnap. 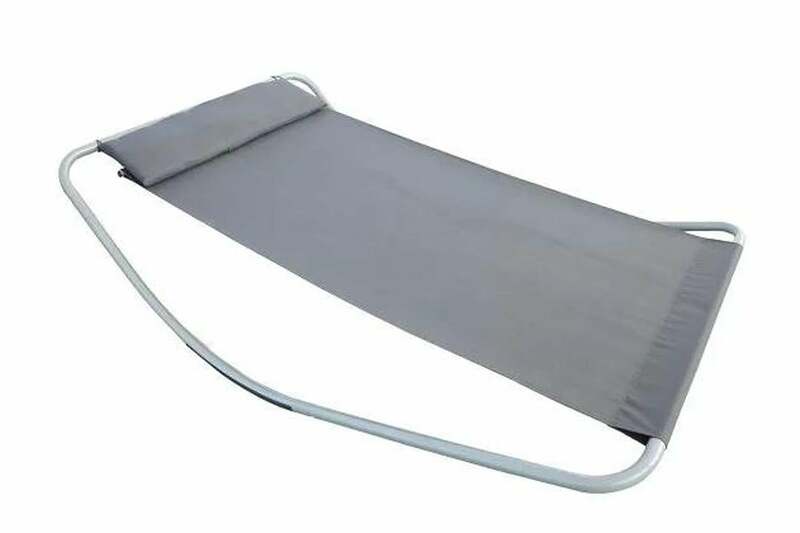 Set on a curved durable steel stand that might as well be guaranteed to put you to sleep thanks to its ‘rocking’ design, the hammock bed is made from an all-weather PVC-coated polyester fabric that can hold up to 220 pounds. Also included in the price is a pillow to rest your head on, so it’s a nice comfortable option and quite frankly, it’s a bit of a show-stealer. Set it outside along with a side table for your cocktail and some music to drift off to. Heaven! When you want a hammock for right here, right now, but don’t want to pay a lot then this botanical beauty could be the one. 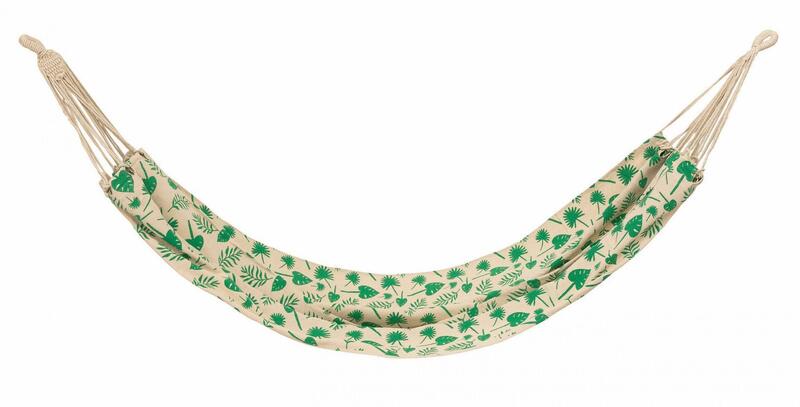 At the bargain price of £15, it’s a two-metre long hammock featuring an on-trend green leaf pattern that will blend perfectly with the greenery of any garden. It measures 200cm x 100cm so although it’s not the largest design on the market, it’s certainly roomy enough to be able to relax comfortably in. It doesn’t come with a stand, so you’d need to buy that separately (unless you have a convenient set of trees from which to string it) but at that price you really can’t go wrong. If being at one with nature appeals to you then a tent in the trees is certainly your bag. 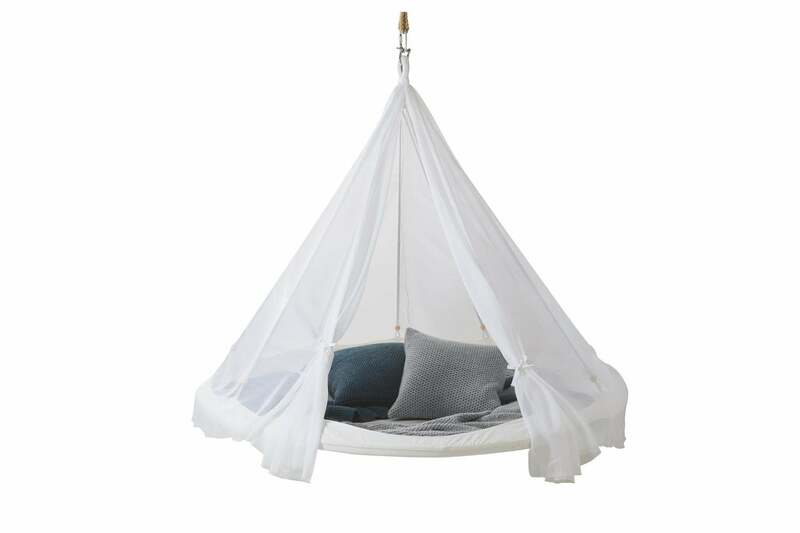 Designed with outside relaxation in mind, the enchanting Cacoon hammock is the ultimate place to unwind and its easy-to-assemble kit means you can pop it up in your garden quickly and with little stress. Suitable for indoors and out, the design is influenced from the intricate cocoon-shaped nest of the Mexican Weaver Finch and is made from a polyester and cotton blend, which has been treated against mould, bacteria, water and UV rays. Hang from a tree or buy a tripod stand separately, it’s suitable for one person at a time – but we wouldn’t want to share this outdoor hideaway anyway. When you want something to be totally unique there’s no better way than to personalise it. With companies offering their services to add your favourite words on everything from notebooks and bags to cushions and mugs, we know they make a great gift – even if it is a gift just for yourself! 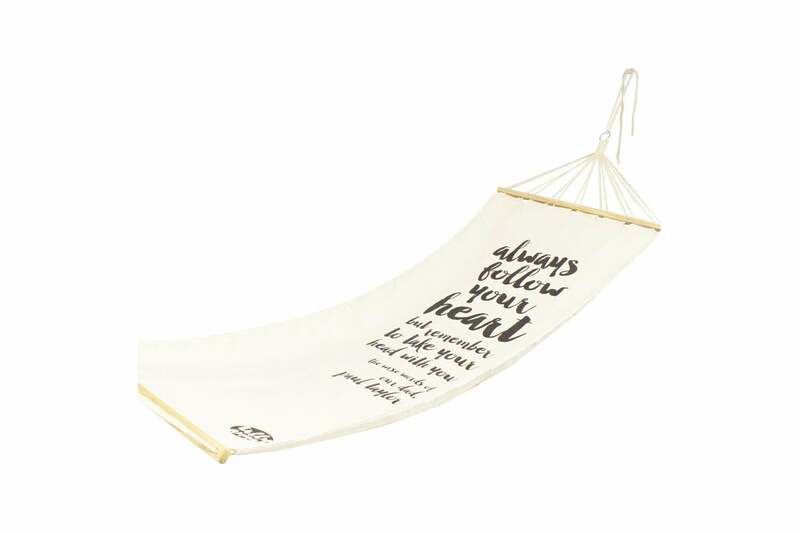 When we spotted these personalised hammocks we couldn’t resist adding them to the mix – after all, if you’ve got a favourite quote, saying or song lyric, why wouldn’t you want your wise words down on canvas? Each hammock measures 270cm in length and what they lack in luxury they certainly make up for in novelty value. If you like the style of a hammock but aren’t sure about the heavy immovable frame, then this one but take your fancy. A bit of a hybrid design, the Kajito is an update on the classic deckchair in that it collapses in five seconds, but still has the supportive feel of a hammock. The frame is made from bamboo wood and it comes with two separate covers to suit your mood: Moon (beige) and Earth (taupe) shades. The fabric is durable, anti-mould, water-repellent and bacteria treated, and it makes a comfortable option for the garden or round by a pool. When it’s unfolded it measures H88.5cm x W180cm x D190cm and we love that it’s easy to put away and store when not in use. This hammock truly is the American Dream – a bright and beautiful design that’s large enough to fit all the family. Yes, that’s right, the extra-strong fabrics and hardwood spreader bars give it the strength for up to a 180kg load, so you can fit the kids and dog on too and enjoy some quality time swinging in the sun together. The petrol blue shade makes for a colourful choice and the fact that it’s padded and comes with a pillow for extra comfort really makes this one work that little bit harder for you. Nice and durable, it can be left outside and comes with its own matching bag for storage, although you will need to buy the stand separately. A great family choice. Hammock brand Kammok tried to sell me — a lifelong tent-user — on hanging versus traditional camping. So I went along with the brand for overnights in Texas heat and cool Colorado mountains to see how hammock camping stacks up. I have never been interested in hammock camping; It’s never seemed that comfortable. What about bugs, weather — and how do you move around? As a climbing guide certified by the American Mountain Guides Association, I’ve camped more times than I can count, in just about every condition. An ultralight one-person tent comes near the 1-pound mark, so I haven’t seen the need to hang in the breeze. But Kammok, an Austin, Texas-based brand focused on all things hammock, is near my hometown. So this summer, we arranged a local camping trip to introduce me to sleeping slung, followed up by a kayak and camping outing near Gunnison, Colorado. I started as a nonbeliever, but now I see how hammock camping can add enjoyment to plenty of outdoor endeavors. Here’s how I went from hammock curmudgeon to enthusiast — well, ally, at least. Set up and break down camp faster. There are no stakes, poles, or sleeping pads necessary — just a pair of tree straps and the hammock for mild, bugless conditions. Travel lighter. Kammok claims a Roo Single $69 with a pair of 10-foot Python straps $29 weighs in at 1 pound, 2.2 ounces — together under $100. Expensive ultralight tents, like the Big Agnes Fly Creek HV1 Platinum, come in at 1 pound 7 ounces and run $500. Though the tent is slightly heavier, it includes bug and rain protection. Sleep better. Kammok’s site touts a study that suggests the natural rocking motion of a hammock can elongate the non-REM portion of sleep. Camp wherever you are. In addition to better sleep, hitting the proverbial hay is presumably less of a chore. No need to clear the ground of rocks or sticks, and mud is never an issue. You just need the appropriate trees. Leave no trace. Hammocks never leave smashed-down foliage, and the Python straps spread the load across 1.5 inches of webbing to leave trees unscathed. Some of these claims seem plausible, but I required convincing for others. A local camping trip and subsequent Colorado trip gave me the opportunity to give each reason a stamp of approval — or the thumbs down. Kammok decided on a car camping trip to Pedernales Falls State Park as my initial hammock camping experience. A typical Texas summer guaranteed high temperatures and humidity, a great test for what I considered the apparent venting advantage of hammocks. Upon securing a campsite, two Kammok staffers let me venture off to set up a Roo Double $99 with Dragonfly Insect Net $79 by myself. I had previously set up a Kammok at my house, but I didn’t reference any resources. And even with the added net, common sense got the hammock up more quickly than any tent. The setup is logical, intuitive, and doesn’t require knot tying. So yes, even in an uneducated, unassisted state, getting a hammock up and functional proved faster than a tent. That is, as long as live, suitable trees 12-15 feet apart are available. And with some pro tips from the Kammok designer, setting up became even faster. One Kammok team member warned me my first night in a hammock might be restless. But I had zero issues falling asleep after setting my preferred hanging tension Kammok recommends starting with a 30-degree angle, which was easy with the 20 adjustment points on each Python strap and the hammock’s carabiners. I am a side sleeper and have restless legs. The “hugging” effect of the hammock kept me still for the entire night — a rarity for me — without disrupting my slumber. I also slept on my back, as it was more comfortable than sleeping on my side. Lying on my stomach required much higher hammock tension and, in my opinion, wasn’t as comfortable as a tent floor. Although I was in a “double” hammock, I think it would be difficult for two adults to sleep comfortably throughout the night due to transmitted movement and inability to avoid contact. I enjoyed having the extra space on the hammock as a solo camper, sprawling unimpeded. But for simple relaxation and lounging, the Roo Double was a comfortable and cozy affair for two adults. Kammok rates the Roo Double and each Python strap to 500 pounds, the Dyneema hammock slings to 22 kN, and each Kanga Claw carabiner to 23 kN 13 kN for the Roo Single. All of this quelled any fears I harbored of a sudden midsleep collapse. For safety and comfort, Kammok also recommends a maximum hanging height of 18 inches. And with overnight temperatures in the 80s with relatively high humidity, the airiness under the hammock proved excellent at keeping me comfortable. Even the slightest breeze provided a cooling effect, and the 70-denier LunarWeave ripstop nylon DWR-treated offered much more breathability than coated tent fabric. Overall, hammock camping proved pleasant, easy, and environmentally friendly in the humid, high-temperature Texas testing grounds. But I still needed to try it out for more rugged environs. Kammok and Oru Kayak put on a trip to Gunnison, Colorado, to test its techier offerings, and I was eager to escape to colder temperatures. Our first night found us on a forested mountainside. Trees were in abundance, and the night promised a dip in the mercury. I set up a Roo Single, this time with a wind- and precipitation-proof Kuhli Weather Shelter $169 and 30-degree sleeping bag my own. What was previously an advantage in the heat of Texas became a disadvantage in the mountain cold. The hammock’s openness wasn’t as protective against harsher climes. Another cold-weather hammock camping issue was the added challenge of insulating against the cold air beneath. Theoretically, an insulating pad could work, but an underquilt, like the 30-degree down Kammok Firebelly Trail Quilt $279, is a more elegant, comfortable, and efficient solution. It’s expensive, however. The quilt places the insulating layer underneath the hammock, eliminating loss of loft due to crushing from your body weight. The overnight temperatures dropped into the lower 40s, but I managed to stay warm by engaging the full mummy mode of my sleeping bag and slept well. The next day put us on the Gunnison River at Blue Mesa Reservoir. We paddled to a sandy beach that had a limited selection of trees. Here, I chose to sample the Sunda Tent Hammock $399, a unique, albeit complex, hammock-tent combination. Because of its size and componentry, it was the only shelter we had to stow on the exterior of the kayak. Others’ hammocks were compact enough to stow inside the Oru foldable kayaks. The group congregated in a narrow grove of trees, everyone successfully and quickly finding workable anchors. Finding a suitable tent site in the shade on this beach would have proved difficult, as there wasn’t much flat ground near the trees. I pitched the Sunda in the tent configuration in a separate area than most of the hammocks to secure a flat tent site. This exposed me to the early morning sun, but the Sunda proved breezy, so sleeping past dawn wasn’t an issue. 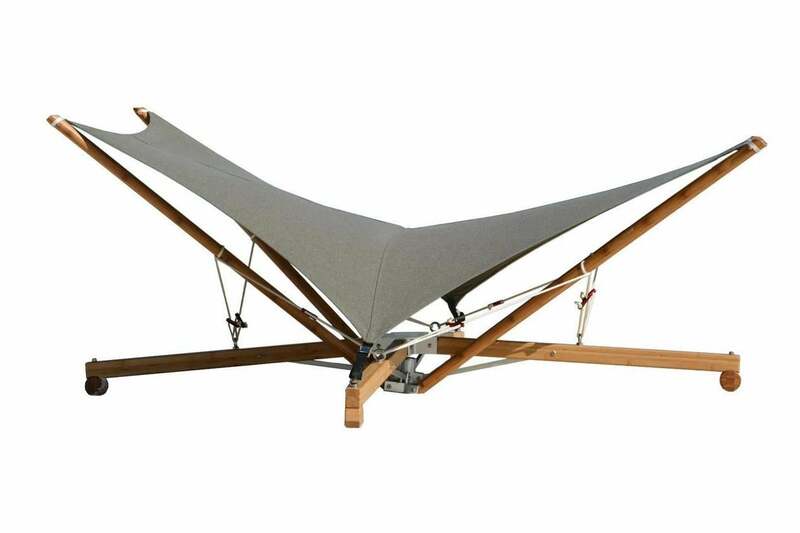 At 100 inches, the tent-hammock’s floor is much longer than a typical two-person tent. This leaves plenty of space above or below the sleeping bags for gear and pets within its spacious 34.7 square feet. Although I didn’t get to try the Sunda as a hammock, a Kammok staffer demonstrated this mode. It was a bit complicated to set up but yielded a hammock with a built-in bug net and fly. The Sunda left a visible footprint in the sand. But all the hammocks indeed left no trace: No telltale signs of a tent floor, only footprints, and trees were left unharmed. I came into these Kammok-sponsored outings as an experienced outdoor adventurer that wasn’t impressed with or overly interested in hammock camping. I figured it would take a lot to sway me into believing the advantages could overcome the disadvantages. Or that the hammock camping movement was nothing other than a hipster-driven, backyard-oriented flavor of the month. No offense. At the outset, Kammok claimed five hammock advantages over traditional tent camping. I tested each of the brand’s claims thoroughly during my outings with the company. Set up and break down camp faster. I now agree that camping hammocks can be quicker to set up and break down. Travel lighter. This is possible in mild conditions. A Roo Single and a pair of Python 10-foot straps weight just over 1pound — compact and relatively inexpensive under $100 compared to ultralight one-person tents $500+. But the hammock package swells in weight, size, and cost if a bug net and tarp are required. Adding Kammok’s accessories increased the claimed weight to 3 pounds, with a total price of $346, negating both weight and cost advantages. And that’s without the underquilt. Sleep better. Sleep is so subjective. I did sleep better and more still in warmer conditions than I typically do in a tent. But this had nothing to do with the rocking motion, as the brand claimed. Rather, the “hugging” of the hammock subdued my restless legs. I also believe that temperatures lower than the 40s Fahrenheit require an underquilt, which adds expense and weight. And should storms brew, a tarp — Kammok’s or third-party — is a must to ensure sound sleep. Finally, stomach sleepers may have issues with creating enough tension to avoid back hyperextension. Camp wherever you are. This is true if there are trees. And that can be a big “if.” Desert dwellers need not apply. Leave no trace. I completely agree. As noted above, all the hammock options left fewer visible signs of human presence than a tent does. One thing Kammok failed to list as a primary advantage of hammock camping is the added fun factor. The novelty and unique feel of sleeping in a hammock added an irrepressible grin to my outings. And having one up for relaxing during the daytime, in favorable conditions, is worlds nicer and more social than crawling into a tent. For this tester, the bottom line is that hammock camping can add comfort and fun to both front-country and backcountry adventures, as long as 1 the conditions remain mild and 2 appropriate trees are available. And for me, hammocks will also get a favorable nod when the temperatures are high, as they allow more breathability than a tent. Perhaps most importantly, as a dad, I will bring a hammock or three along on every family car camping trip. No matter where we sleep, having hammocks hanging around invites relaxing — a primary goal of any getaway. By Seiji Ishii Seiji Ishii is an adventure journalist that blurs the lines between work and play, writing about his climbing, two-wheeled and on-foot adventures, and the gear involved. He is also an AMGA Certified Single Pitch Instructor and an ACSM certified personal trainer, specializing in climbers and motocrosssupercross athletes. He lives in the woods with his wife, daughter, and a small herd of pets in Wimberley, Texas. While we have a sale on our travel hammocks. We thought you might like to see what you can buy for at least five times the price elsewhere on the interwebs. We believe every season is hammock season. But, as August winds to a close, it’s hard not to think about the crisp, cool feeling of fall. What better time of year for a nature trek, a hammock hanging, and a deep soul-searching session between two trees? Here are the four best camping hammock designs for travelers, hikers, and outdoor lovers. Sea to Summit’s products are as lightweight and straightforward as their names. The Ultralight Hammock is exactly what it sounds like — a compact, flyweight hammock designed to get you hanging in the simplest way possible. From its built-in, soda-can-sized stuff sack, it unfurls to a spacious 8’6” long x 4’ wide (even larger with the XL size) which is enough room for a six-foot-tall fellow. The 20D monofilament nylon construction is highly breathable and guaranteed to hold up to 300 pounds. For a more substantial option, Kammok offers the Roo line of hammocks. At 10 ounces, the Roo Single is heavier than its Sea to Summit counterpart. But that added weight is due to its durable Gravitas 40D ripstop nylon construction capable of supporting 400 pounds. It still packs down small, yet unfolds to an 8’4” x 4’2” footprint. It’s available in a variety of sharp, fade-resistant colors, and comes pre-broken-in for an ultra-soft feel straight out of the box. Upgrade to the 10-foot-wide Roo Double if you’re planning to bring a friend. We’re also partial to the company’s strategy of giving a portion of all proceeds to support young outdoor explorers in the Explore Austin program. The Mock ONE from Republic of Durable Goods is touted as “the world’s most compact folding hammock.” It’s designed to be pitched literally anywhere, even in areas without trees. The steel frame makes this a heavier option than others on this list, but it supports up to 250 pounds and the seat “floats” 18 inches off the ground. It includes a carry bag and a sunshade, plus additional accessories are available including a warm top-/underquilt, a weatherproof tarp, and bug netting. While we’re skeptical of crowdfunded goods, the Mock ONE Kickstarter project has already received a quarter of a million dollars (on a modest $10K goal) from nearly 1,000 backers. It seems likely this clever almost-hammock will see the production line as planned. Delivery for Kickstarter backers is slated for December 2018. It’s difficult to classify Tentsile’s now famous outdoor products. They’re part tent, part hammock, and part backcountry treehouse. The Connect Tree Tent is their entry-level product and the one that made them a household name among hikers, campers, and outdoor lovers. If you’re only after a basic hammock to quietly while away an afternoon in the woods, this might be overkill. If, however, you’re looking to replace a third of the gear in your pack (tent, sleeping pads, hammocks, bug net, etc. ), it may be just the trick. The two-person Connect is designed to “float” between three strong anchor points — trees, boulders, even a few truck beds will do. Inside, you’ll find a spacious, 53-square-foot living area for relaxing, sleeping, and other “couple’s pursuits.” The included no-see-um mesh top, fold-away doors, and removable rain fly all make the Connect a great, four-season home base in almost any weather conditions. If you’ve been putting off buying a hammock because you’re intimidated by the process of hanging one, we have you covered.